The Honda Element. It can climb to the top of Haleakala, or cruise the narrow coastline roads with ease. It sports a large cab with comfortable air conditioning, and it’s a great alternative to standard rental car. Best of all: it comes fully equipped with all the camping gear you might need! While the Element is not converted into a camper (yet! ), you can choose to either set-up the large dome tent, or put up the seats and sleep in the back of the car. 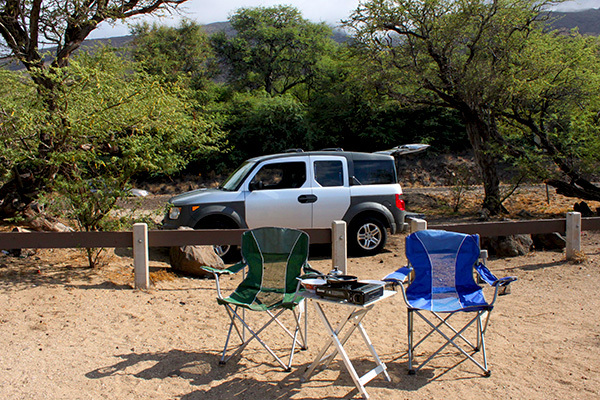 Renting the Element allows you to camp at the Hosmer’s Grove campsite in the Haleakala National Park, which is inaccessible to the VW campers.